You Are Here: Home > Where Is the Closest Toyota Dealership near Me? Where Is the Closest Toyota Dealership near Me? Are you trying to locate a Toyota dealer? If you’re looking for a Toyota dealership nearby, LeBrun Toyota is here for you. Our Toyota dealer near Geneva, NY, offers exceptional Toyota sales, service and financing to drivers from Canandaigua, Geneva and beyond. Whether you’re shopping for a new Toyota RAV4 or looking to schedule Toyota service for your Tacoma truck, we are the closest Toyota dealership near you. Take to the streets of New York in the new Toyota you’ve been dreaming of when you visit our nearby Toyota dealer. From new Toyota Camry sedans to Toyota Highlander SUVs, there’s something for everyone at LeBrun Toyota. We also have plenty of Toyota trucks for sale near Geneva, including Toyota Tacoma and Tundra models. Upstate NY drivers are sure to love our vast used Toyota inventory, whether they’re in the market for a used Toyota Corolla or a pre-owned Toyota 4Runner. And once you know exactly which Toyota is best for you, our Toyota finance experts will help you secure an auto loan or Toyota lease agreement that meets all your wants and needs. Searching for Toyota service near you? Stop by our Toyota service center, where you can get the timely and thorough Toyota repairs and maintenance you need. From Toyota oil changes and tire rotations to brake service and engine repairs, no task is too big or too small for our certified technicians. If you need OEM Toyota parts to make repairs, just ask the service team at LeBrun Toyota. With floor mats, spark plugs, windshield wipers and more for sale, our fully stocked Toyota parts department will provide you with the exact components you need. We also have genuine Toyota accessories for sale! 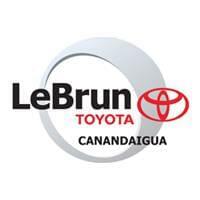 You can find LeBrun Toyota at 2435 Rochester Road in Canandaigua, NY, which is just a quick drive from Geneva for all of your automotive needs. We hope to see you soon!